Suggested Use: 1 softgel daily, preferably with a meal. Beta-carotene belongs to large group of compounds known as carotenoids that have been widely studied for their protective effects against cancer and heart disease. Beta-carotene is a source of vitamin A — the body converts beta-carotene into vitamin A as needed. 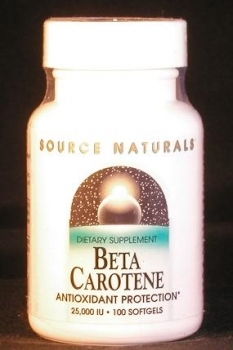 Beta-carotene is also used routinely to treat certain photosensitivity diseases. Generally speaking, the effectiveness of beta-carotene is enhanced when it is combined with other carotenoids, such as lycopene and lutein. The bioavailability of oral beta-carotene supplements is low but can be increased about 60% by adding a piperine supplement (such as Bioperine®) at 5 mg/day. Beta-carotene belongs to large group of compounds known as carotenoids that have been widely studied for their protective effects against cancer and heart disease. Beta-carotene is thought to be an antioxidant, but its primary role in nutrition is as a source of vitamin A — the body converts beta-carotene into vitamin A as needed. Many studies have shown that beta-carotene supplementation can prevent or inhibit various cancers — such as cancers of lung, skin, colon, stomach, and liver. But recent studies have also shown that nicotine and heavy alcohol usage can reverse this effect. A similar phenomenon has been seen in heart disease — beta-carotene is protective except in smokers and drinkers, where it becomes a liability. On the other hand, beta-carotene supplementation (at 50 mg on alternate days) has been shown to reduce the risk of cataracts among smokers by about 25%. Among non-smokers, beta-carotene showed no cataract inhibition, but appeared to reduce the risk of advanced Age-related Macular Degeneration by about 25%. Beta-carotene is also used routinely to treat certain photosensitivity diseases. The bioavailability of oral beta-carotene supplements is very low but can be increased about 60% by adding a piperine supplement (such as Bioperine®) at 5 mg/day. Animal experiments suggest that a zinc supplement might act similarly.